Best of NXT Vol 1. This set is dedicated solely to the matches from NXT's five TakeOver specials. It features eleven full matches and I am not joking when I say there is not one match that Dave Meltzer has not marked below Three Stars. This just shows you the quality of the NXT product and if this is your first experience of this, then sit back and enjoy, as these NXT Superstars are the future of the WWE. From NXT TakeOver: Philadelphia we have the Extreme Rules Match between Aleister Black and Adam Cole which is a solid match between the two and had some amazing moments. The NXT Championship Match between Andrade ‘Cien’ Almas and Johnny Gargano was the first Five Star Match from NXT (and not the last) I would say this is a pitch perfect match, the kind of match which people will watch in years to come to show them what a perfect match should look like. 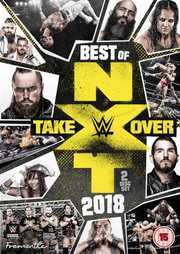 Speaking of perfect match, at the next event NXT TakeOver: New Orleans they crowned the first NXT North American Champion in a six-way Ladder Match featuring Adam Cole, EC3, Killian Dain, Lars Sullivan, Velveteen Dream and Ricochet in one of the best examples of a multi-man ladder match ever and another perfect Five Star Match. At NXT TakeOver: Chicago 2 there are two matches. A great match between Velveteen Dream and the amazing Ricochet and the unbelievable Chicago Street Fight pitting former allies Tommaso Ciampa against Johnny Gargano. Both matches are given enough time to mean something and that is one of the most important things as it allows you to connect with the characters and nothing feels rushed. NXT TakeOver: Brooklyn 4 features three matches. The only tag match (Which is a shame as the NXT tag division is always a highlight) however, the match between Undisputed Era (Kyle O’Reilly and Roderick Strong) and Moustache Mountain is fantastic. This is followed again by the amazing NXT North American Championship match between Adam Cole and Ricochet which shows just how great these two are together and definitely a match of high moments. Oddly enough, considering how integral the Women’s division has been over the last few years, there is only one match featured which is the NXT Women’s Championship match between Shayna Baszler and Kairi Sane. This was a good match, but nothing that special. This is a shame, as I feel that NXT have failed to replace a lot of stars they called up to the main rosters such as Asuka and Bayley and maybe they should have included the Two out of Three Falls match between Baszler and Sane at Wargames 2 which was a better match. Finally, there are also three matches from NXT TakeOver: Wargames 2. Johnny Gargano against Aleister Black is another great match and both Gargano and later Tommaso Ciampa are standout players for NXT throughout the whole of 2018. Ciampa’s match against Velveteen Dream was again a great match and both worked well together. Finally, (though oddly on the actual event it was the opening match) we have the Wargames match pitting Undisputed Era (Adam Cole, Bobby Fish, Kyle O’Reilly and Roderick Strong) against Pete Dunne, Ricochet and the War Raiders. This is a great throwback to the old NWA days and really felt like a brutal, but hugely effective match. I was never usually a fan of this type of match, but as with the previous year, the match worked and hopefully they keep this as an annual NXT-exclusive event. It is very rare when I say that something is perfect, but this set is perfect. Each match is excellent and even matches that are not as good as the others (such as the Baszler/Sane match) is still acres ahead of most average WWE matches. I can safely say (doing my best Terry Funk impression) if you are a fan of wrestling, spelt W R E S T L I N G then this is the DVD for you!